The District Attorney’s Office is always seeking highly qualified lawyers to serve as Assistant District Attorneys. Applications are accepted year-round. Applications are retained for 12 months and reviewed each time a vacancy occurs. Law school students may submit an application in their final academic year . To apply, you must submit the required materials listed below. You may submit the optional materials if you wish. Please do not send these items separately; submit all materials in one packet. Within your materials, please be sure to indicate whether you are licensed to practice law in North Carolina. 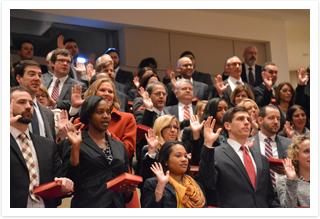 If you are not currently licensed, indicate the month and year in which you intend to take the N.C. Bar Exam. The office does not accept applications by email or fax. Application packets that do not include all of the required materials will not be considered.